The new Digi® WR54 LTE-Advanced router provides a hardened, robust communication solution for transit and industrial applications in demanding conditions. 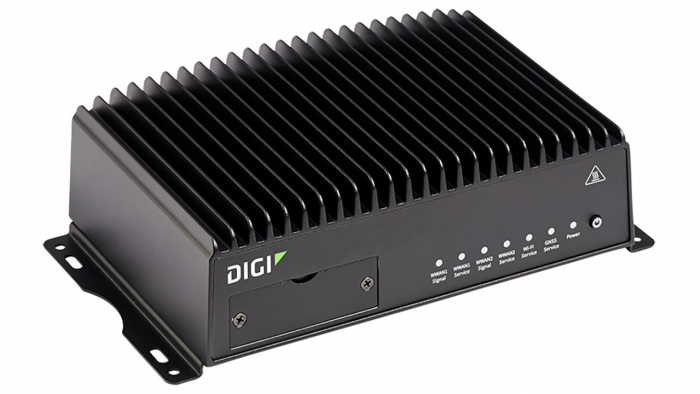 Digi International recently released the Digi WR54 multi-LTE router, built with a hardened MIL-SPEC-certified design to meet the rugged wireless connectivity requirements of data-on-the-move applications. A range of use cases in industrial environments, transportation and smart cities can benefit from the powerful multi-tasking capabilities of these heavy-duty routers. Digi WR54 includes LTE-Advanced and Wi-Fi cellular modules that support the higher throughput capabilities of today’s networks. Where many industrial routers have not kept up, Digi has next generation cellular radios capable of up to 600 Mbps. These devices not only optimize bandwidth today but are well positioned for the future as enterprises prepare for 5G network capabilities. Public transit, railways, and fleets of trucks, buses and emergency vehicles require fast throughput for communications. Transit organizations can now take advantage of increased cellular network speeds to optimize operations, while improving passenger experiences and boosting ridership. Digital signage applications can benefit enormously by simplifying infrastructure and costs, as one Digi WR54 router can replace many when located in close proximity. Industrial sites as well are poised to make use of applications that require faster throughput. The Digi WR54 cellular router is built with a die-cast aluminum enclosure to withstand the most demanding environmental conditions, including temperature extremes, dust and vibration. Certified to MIL-SPEC 810G, IP54, and the latest automotive standards, the Digi WR54 is suitable for a wide range of transit, industrial and outdoor applications. These use cases require secure, rugged and reliable connectivity solutions to carry critical data communications. Transit system integrators need connectivity for fleet tracking, logistics, engine and driver performance, fare collection and digital signage. Industrial organizations such as utility companies must monitor high-value assets in the field, often in remote areas and harsh environments. At the same time, they need to reduce vulnerability to cyberattacks. Outdoor applications such as highway and metropolitan digital signage are exposed to extreme environmental factors, requiring a hardened, sealed, industrial enclosure to maintain functionality in these challenging conditions. A dual-core 880 MHz MIPS processor that supports higher network speeds and capabilities as infrastructure is updated. Certifications including SAE J1455, MIL-STD-810G and IP-54 ratings to withstand water, dust, heat, vibration and other challenges found in transportation and industrial environments. Optional multi-LTE radios for continuous connectivity between carriers for users that cannot tolerate downtime. Digi WR54 automatically switches to a secondary carrier. Digi TrustFence®, a device security framework, is designed into the Digi WR54 to simplify the process of securing connected devices. TrustFence enables organizations to adapt to new and evolving threats over time. Tenets of this framework include secure boot, protected ports, encrypted storage and ongoing best practice security monitoring. Additionally, users can easily manage both Digi and third-party devices with Digi Remote Manager®, a web-based management tool that monitors the health of deployed devices and networks. Learn more by watching our introductory video. As IoT becomes pervasive across transit systems, industries and municipalities, the need for secure, reliable network solutions that support data-on-the move, and the environmental impacts of vibration and weather elements, is imperative. The Digi WR54 supports the needs of industrial outdoor applications and transit systems with the latest wireless technology capabilities, in an environmentally-certified design to handle the most demanding applications. See the product specifications. >>> For assistance selecting the right cellular router for your application, contact us to be put in touch with an IoT expert.